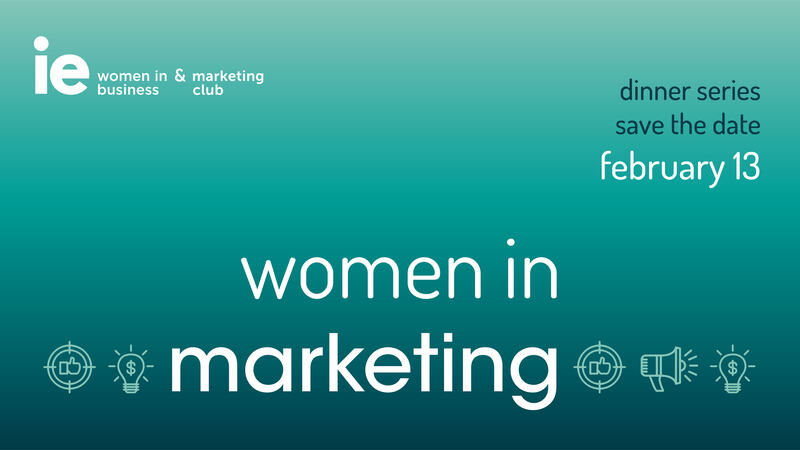 Join the IE Women in Business and IE Marketing Clubs on February 13 for an intimate dinner and discussion with women in marketing. For the second dinner of the year, we are gathering top professionals with extensive experience in marketing. The IE Women in Business Club organize bi-weekly industry themed dinners. The dinners are aimed at strengthening the network of women at IE and have gained exponential traction over the years. The format will be four professionals and 15 graduate students in an intimate gathering, fostering an environment of authenticity. Past events have included executives from: L’Oreal, Mastercard, LVMH, Accenture, McKinsey & Co, BBVA, IKEA, Amazon, Google, Facebook, Salesforce, Deliveroo, and Cabify to name a few. Due to the high popularity of these dinners, participants will have to demonstrate an interest in pursuing a career in this field by answering a question in the application. After submitting your application you will be put on a waiting list until the registration is closed. Successful candidates will be notified and have the opportunity to buy their ticket within 24 hours upon notification from the IE Women in Business Club. If a student fails to do so by the deadline, the spot will be given to the next person in line. Bárbara Calixto is the global VP of Marketing of Cabify. Prior to joining the Spanish ridehailing company, she held roles in Marketing, Merchandising and Operations in different industries, including Retail and Tech. Bárbara is passionate about building brands that can earn the admiration and loyalty of the ever-demanding, digitally-connected, socially-concerned and ecologically-aware customer of today. Born in Brazil, she holds a degree in Business Management from the University of Brasília and an MBA from the University of Michigan. When not working on making cities a better place to live by improving mobility in the largest urban centers in Iberia and Latam, you can find her travelling, attending a big concert, skiing, visiting her family in Brazil or at the nearest yoga studio. Sometimes multiple of those things at the same time. Katharina Haynes Bethea has over 15 years of experience working in Sales and Marketing. Most recently, she was the District VP for Inmar selling and implementing digital and analytical based solutions into retailers across the US. It was her experience working with retailers such as Walmart and Target in Marketing and Merchandising as well as first-hand knowledge of CPG practices that led her to make the leap into the digital space. Katharina understands the importance for businesses to underpin a sound digital strategy with solutions that meet their unique needs. Prior to earning her MBA from Wake Forest University, Katharina worked for an IT consulting company in Germany as well as for UPS in Connecticut. She is an active volunteer with Greenhouse Scholars, an organization uniquely serving the needs of first-generation college students. Katharina is also an experienced yoga teacher and teacher trainer, currently teaching with CorePower Yoga. Pilar is the Marketing Manager for Spain and Portugal at BlaBlaCar - the world-leading online marketplace for carpooling. BlaBlaCar’s website and mobile apps connect drivers and passengers willing to travel together between cities and share the cost of the journey. As the Marketing Manager, Pilar works with BlaBlaCar’s marketing strategies, combining online and offline channels to reach business objectives. Furthermore, she leads the branding strategy and the optimization of campaigns directed at the company’s various target groups. Pilar has a degree in Business Administration and Management from ICADE and her career has always been connected to the world of marketing in global firms such as Rocket Internet, Accenture Interactive and Spotahome.